Dermalogica Power Rich is much, much more than just a moisturiser. Once you have tried this product you will understand why. Dermalogica Power Rich is between a 5 to 10 week course. You are supplied with 5 tubes that each should last 1 to 2 weeks and once the tube is opened it must be fully used within 2 weeks. The ingredients used are pharmaceutical strength and will deteriorate and loose their effectiveness very quickly. Dermalogica Power Rich is the ULTIMATE age preventative and skin restoring skin care product. 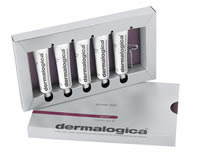 This product is better now than ever as it now contains Dermalogica’s fantastic AGE Smart ingredients. The products key benefits are to stimulate cell renewal rates and optimise skin cell turnover, which in turn will repair any damaged tissue. It will also supply the skin with vital nutrients to help reduce fine lines, whilst resurfacing and regenerating the skin. There are a whole host of other great benefits to Dermalogica Power Rich which are detailed on our website. When you are using Dermalogica Power Rich you will not need to use a Booster or an Eye Cream as it contains everything your skin will need and can be used around the eyes as well. The only thing you may need to use is a Moisturiser if your skin is dry. You can use this product once or twice a year to give your skin a real boost then return to your normal skin care regime, or you can use Dermalogica Power Rich over a longer period of time. please sell smaller sizes more priced for an every day market PLEASE!! We will certainly pass your comments on to Dermalogica but we think it’s all about the requirement for completing the short burst course. This product is far too expensive for what you get. I purchased it and have noticed no difference whatsoever in my skin, if anything it caused breakouts because it is greasy. I feel very disappointed that I have wasted my money on this product and will certainly not be repurchasing.